Lipids are unique organic compounds, each serving key roles and performing specific functions within the body. As we discuss the various types of lipids (triglycerides, phospholipids, and sterols) in further detail, we will compare their structures and functions and examine their impact on human health. Triglycerides are the main form of lipid found in the body and in the diet. 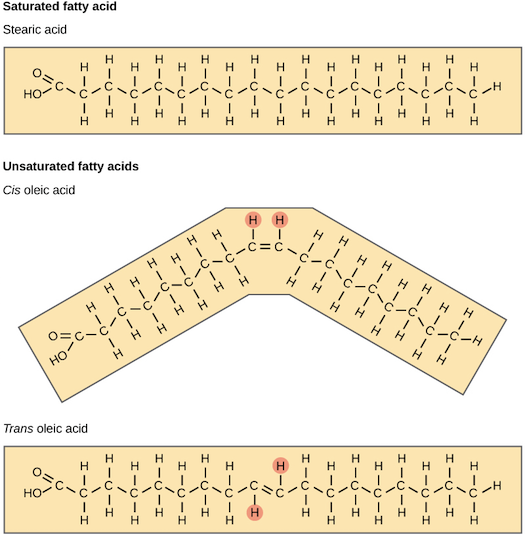 Fatty acids and glycerol are the building blocks of triglycerides. Glycerol is a thick, smooth, syrupy compound that is often used in the food industry. To form a triglyceride, a glycerol molecule is joined by three fatty acid chains. 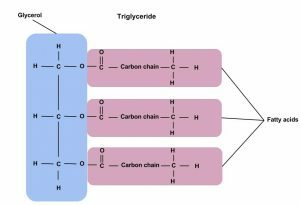 triglycerides contain varying mixtures of fatty acids. Fatty acids determine if the compound is solid or liquid at room temperature. Fatty acids consist of a carboxylic acid (−COOH) group on one end of a carbon chain and a methyl group (−CH3) on the other end. 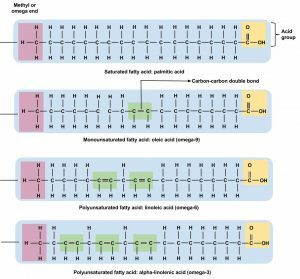 Fatty acids can differ from one another in two important ways—carbon chain length and degree of saturation. The fatty-acid profile of the diet directly correlates to the tissue lipid profile of the body. It may not solely be the quantity of dietary fat that matters. More directly, the type of dietary fat ingested has been shown to affect body weight, composition, and metabolism. The fatty acids consumed are often incorporated into the triglycerides within the body. Evidence confirms that saturated fatty acids are linked to higher rates of weight retention when compared to other types of fatty acids. Alternatively, the fatty acids found in fish oil are proven to reduce the rate of weight gain as compared to other fatty acids. According to the ongoing Harvard Nurses’ Health Study, trans fatty acids have been associated with increased risk for coronary heart disease because of the way they negatively impact blood cholesterol levels. How Lipids Work by University of Hawai’i at Mānoa Food Science and Human Nutrition Program is licensed under a Creative Commons Attribution-NonCommercial-ShareAlike 4.0 International License, except where otherwise noted.